Landscape designers and architects know that Graniterock is the supplier of choice for top-quality Landscape Supplies and Materials. 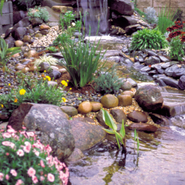 Graniterock has an extensive selection of landscape accessories, ground cover and pond materials to accent any project. We carry rock, sand, gravel, flagstone, topsoil and mulch.